Attacks on sacred books and sacred personalities have been a challenging enterprise from colonial times for anthropologists, behavioral scientists, historians, theologians, archaeologists, neuroscientists and philosophers alike. Their overall objective is to seek explanations for the continuing influence of religious practices in human societies especially among the masses at large in spite of their dissonance with the scientific worldviews that have evolved since the European Renaissance. The most recent trend in this regard is to apply Freudian Psychology to explain religious phenomena and religious personalities. scientific enquiry. Hinduism happens to be a major religion in the modern world that poses a threat to the spread of Islam and Christianity. Its message of the universality of all religions is acceptable to any of the three Abrahamic religions. It is not surprising therefore that Jeffrey Kripal’s “Kali’s Child” and Paul Courtright’s ” Ganesa” are but two out of numerous other books that are damaging to the sentiments of millions of Hindus in spite of their scholarly recognition by their peers and widely glorified by prestigious awards. 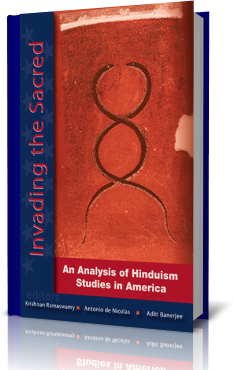 ” Invading the Sacred ” by Krishnan Ramaswamy, Antonio de Nicolas and Aditi Banerjee with Rajiv Malhotra as the driving force behind, is an emotionally charged but profoundly justified rebuttal to the explorations into the sexuality of Hindu gods, goddesses and saints such as Ramakrishna Paramahamsa in these books in terms of Freudian Psychology by Western scholars. Unfortunately, the rebuttal is not scholarly enough to tip the balance. I came to this realization after I came across another book called ” Encountering Kali” edited by Rachel Fell McDermott and Jeffrey Kripal published in 2003 and republished by Motilal Banarsidass in 2005. It contains twelve chapters written by different authors with almost a hundred books and articles from refereed journals quoted in the Introduction alone. The book addresses literally hundreds of issues related to Kali and Kali worship in India in a manner not unlike ” Kali’s Child ” This book too is but a tip of the Iceberg that is on the horizon. scholarly fashion in which many issues of relevance to Modern Science were addressed by members of the Haiti Vedanta Institute quoting from this treatise at a recent conference in Titupati, India on Science and the Spiritual Quest that I attended and presented a paper. Threats, Acts, Jealousies and the Dictatorial aspects of the God of Abraham elaborated to in the Old Testament, the atrocities of the Crusades, the Burning of dissidents and the so-called Witches and the sexual perversions and promiscuity among the leaders of the Abrahamic religions, past and the present. variedly.” This ancient dictum applies to all knowledge and all paradigms- scientific, spiritual or otherwise.